1. Faucet for Instant Hot Water and Filtered Water. (1) heating tank. ​Our four showroom locations located in Fishkill, Kingston, Catskill and Brewster have all types of kitchen products on display. Generally speaking, most sink accessories are specific to your sink. 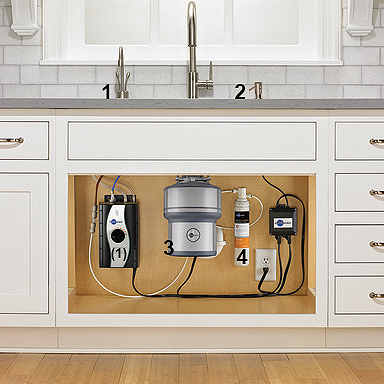 Other items such as soap dispensers, instant hot water, and drinking water solutions can be added to any kitchen fairly easily. We can help you decide which accessories are useful for you. Contact Us or stop by one of our locations and we will help you select the kitchen products you need at prices that fit your budget. We look forward to being of service to you.